The Trump administration was dealt a major blow when congressional Republicans' push to dismantle the Affordable Care Act hit a wall earlier this year. Regardless, the administration has been pushing forward with initiatives that industry insiders say will undermine Obamacare. The CMS has significantly altered the way ACA navigator groups are paid, tying funding to whether they met their enrollment goals during the previous year. Total funding for those navigators—people trained to educate consumers about their insurance options and enroll them in exchange plans—is expected to be cut by about $36.8 million. Last year, navigators were awarded $62.5 million in grants. The average wage in 2013 was $20 an hour. The CMS also took a hacksaw to the outreach and marketing budget for the exchanges, reducing funding to $10 million from the $100 million the Obama administration had spent during the previous open-enrollment period. In a release announcing the change, the CMS said marketing will be done primarily through digital media, email and text messages. "These outreach methodologies have proven the most effective in reaching existing and new enrollees," the agency stated. The Trump administration's move to slash funding for ACA outreach and marketing, as well as grants for navigators, will likely weigh down enrollment in the already shaky exchanges. 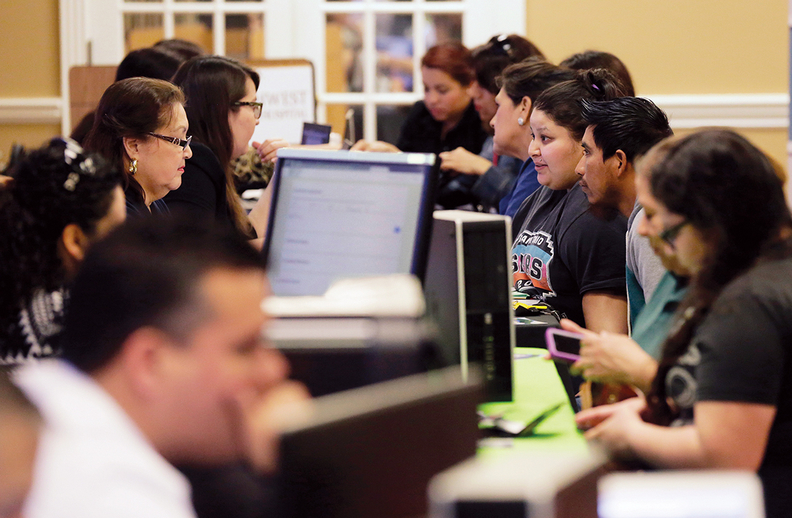 Navigators are critical to the success of open enrollment, health reform experts insist. They fear that slashing funding while also gutting the marketing budget will lower enrollment in the exchanges and further destabilize the already shaky individual market. And hospital administrators worry that uncompensated care, which has significantly decreased under the ACA, will rise again. "The administration wants to limit enrollment opportunities, and this is one of the many ways they are doing that," said Elizabeth Hagan, associate director of coverage initiatives at Families USA, a consumer advocacy group. Navigators are already feeling the squeeze. The Palmetto Project, the lead navigator in South Carolina, found out Sept. 14 that it would receive $501,038 to educate and enroll consumers during the next open enrollment that begins Nov. 1, a budget cut of more than half of the $1. million grant it received in 2016. "It is devastating internally and not a reflection of the quantity or quality of the work that we've provided to the residents of our state," said Shelli Quenga, the Palmetto Project's director of programs. The University of South Florida, which was awarded the nation's largest navigator grant in 2016 at $5.8 million, took a $900,000 cut, according to Jodi Ray, director of Florida Covering Kids & Families at the university. Ray said her organization had met the enrollment goal it set last year. The CMS notified navigators of their grants nearly two weeks after the current budget period was supposed to start on Sept. 2. Navigators received little information from the CMS about when they could expect to receive their contracts and didn't know how much funding they would receive, forcing many groups to suspend services. The Palmetto Project and others were forced to lay off staff. At least one group, the Epilepsy Foundation of Florida, shut down its navigator program. While the CMS said its new funding formula for grants ensures accountability, navigators argue the formula is unfair and doesn't reflect the value of the services they provide. The formula works like this: A grantee that achieved 100% of its enrollment goal for plan year 2017 will receive the same level of funding as last year, while a grantee that enrolled only 70% of its enrollment goal would receive 70% of its previous year funding. Navigators successfully enrolled 81,426 individuals during the last open-enrollment period, or less than 1% of all enrollees, according to CMS data. The agency also found that 78% of the groups failed to achieve their enrollment goals. An HHS spokesperson referred to navigators' performance in the fourth open-enrollment period as "abysmal." But navigators say they do more than simply help people fill out applications. They are required by the federal government to also respond to consumers' questions about health insurance, help them understand their coverage, enroll them in Medicaid, refer them to other services, and even verify their immigration status at times, Quenga said. Her full-time navigator staff members are paid about $30,000. Often, people spend an hour with a navigator, and then go home to talk with a spouse before finishing the insurance application online. When that happens, navigators don't get to count that application toward their total enrollment goal. Quenga said her staff worked with as many as 79,000 consumers during the last open-enrollment period, but enrolled only 1,900 of those in person. Had she known that the Palmetto Project's funding would be based off the goals navigators set themselves, Quenga said she would have lowered the bar. "It's very frustrating given the amount of time we spend with consumers and how personally committed to this work the staff are," Quenga said. The upcoming fifth open-enrollment period is likely to be a difficult one. In addition to the funding cuts for ads and navigators, this year's open enrollment in states that use the federally operated HealthCare.gov exchange has been shortened to end on Dec. 15. It typically stretches until Jan. 31. Consumer choice has dwindled since the last open enrollment. Many insurers, such as major marketplace player Anthem, have scaled back their participation on the exchanges because of financial losses and uncertainty over whether the federal government will fund crucial cost-sharing reduction subsidies and enforce the individual insurance mandate. "A lot of people are going to be looking for new carriers, including those previously assisted by navigators," said Michael Levin, CEO of Vericred, a healthcare data services company. He added that most of the consumers who went to navigators for help were those that needed it most and didn't have a way to enroll on their own. It's unclear if the navigators will be able to assist as many people on smaller budgets. There are other types of enrollment helpers, including certified application counselor organizations, which could include community health centers or healthcare providers that perform many of the same functions as navigators but do not receive funding from the CMS. Brokers also help customers enroll in the marketplace plans. But because many insurers have reduced or stopped paying brokers' commissions for individual insurance products, some brokers have put their resources in other product lines, Levin said. The navigator and outreach funding cuts are predicted to hold down enrollment. "People are concerned that enrollment could decline as a result of these two actions," said Karen Pollitz, a senior fellow at the Kaiser Family Foundation, adding that it will also hurt the individual market's risk pool. Premiums go up when the risk pool worsens. California's state-run exchange, Covered California, on Sept. 13 predicted that 1 million fewer Americans would enroll in the exchanges as a result of the funding cuts, and that premiums would increase 2.5% for those consumers who do enroll. California's ACA marketing budget of $111 million for 2018 dwarfs what the federal government plans to spend on the 39 states that use the federally operated marketplace. Without the right help, fewer consumers might enroll in exchange plans, but others may sign up for plans that don't fully cover their needs, said Dr. Stephen Klasko, CEO of the Philadelphia-based Jefferson Health system. Either way, the uninsured and under-insured will still show up at the hospital, and hospitals will end up having to absorb more uncompensated care.